I remember sitting on the front porch at my grandfather’s house. A soft, cool breeze would float by, my grandpa would be sitting on the porch swing just slightly rocking back and forth and the chains would creak a little every now and then. My Mom and Grandmother would be in the kitchen, making wonderful kitchen sounds that made you feel like you were going to just cave in before dinner was ready. Grandpa would lean over to the side, making the chains creak a little louder. I knew without looking that he was reaching over to turn on the radio and I’d settle back in the old rocking chair and wait for the radio to warm up. That old radio would hum and buzz and glow that warm yellow-orange from the dial – the only light on the porch as the dusk started to give way to the dark. It seemed an eternity waiting on the old radio to warm up, but finally through the crackle and hiss I would hear a familiar voice announcing the game, or maybe it would be the crack of the bat or the noise of the crowd. It didn’t really matter; I knew that Grandpa was tuning in a ball game as we were waiting to be called into supper. That was our nightly routine when we visited in the summers so long ago – his “wind-down” time was what he called it. It also didn’t really matter what team, either. 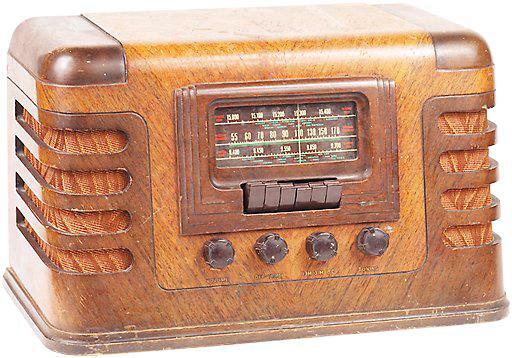 It could be the Cubs or the Giants, the Royals or even the Brewers as long as it was baseball and the crowd was a little noisy and the announcers could be heard over the static and hiss and pop from that old radio. There are several states and hundreds of miles between me and that porch now. I can’t even begin to imagine where that radio is these days. But every now and then, when I hear a ball game on the radio, especially on a warm summer evening with the crickets chirping and the lightning bugs glowing I am back on that porch, watching my Dad and Grandpa talk, catching a whiff of dinner and hearing the pop and crackle of that old radio – even if its only for a moment or so. Beautiful! So poignantly told, I was right there with you. My grandparents had a wonderful porch with a swing, and when we would visit them in Ohio every summer, I’d sit on that swing and be so happy to be there in their house. I’ve always wanted a porch like that so I could sit and watch the world go by, but it doesn’t look like that will ever happen. Sigh. Well done! Thank you for your kind words! Sadly I, too, am still waiting for my own front porch with a swing. Don’t give up hope though. You never know what is right around the corner! Loved this post as I too grew up on that porch but long after Granddad was gone. I hate I didn’t get the chance to know him. You brought back many great memories for me of a much simpler and peaceful time. Brought a tear or two. Thanks.